Key contemporary buildings in the city which can be visited on our tours include the Moscow School of Management, SKOLKOVO and The Mercury City tower, now Europe’s tallest building. Major architects featured include Zaha Hadid Architects, OMA, Foster + Partners, Massimiliano and Doriana Fuksas architects, Erick van Egeraat and Adjaye Associates. The development includes office space and a new art gallery space housing the client’s collection of Russian art. The project comprises 17 buildings. The scheme included restoration of the first buildings in Moscow to boast electric light. 1 Nov 2012 – The Mercury City tower in Moscow is now Europe’s tallest building after overtaking The Shard in London. The mixed office and residential tower has topped out at 338 meters (1,109 feet). Garage Center for Contemporary Culture will present a new exhibition entitled Temporary Structures in Gorky Park: From Melnikov to Ban from 20 October to 9 December 2012 in a newly created temporary pavilion in Moscow’s Gorky Park, designed by Japanese architect Shigeru Ban. Showing rare archival drawings –many of which have never been seen before – the exhibition will begin by revealing the profound history of structures created in the park since the site was first developed in 1923, before moving through the Russian avant-garde period to finish with some of the most interesting contemporary unrealized designs created by Russian architects today. At the end of August nine international teams presented their final projects for the draft concept for the development of the Moscow agglomeration to a group of experts and the client, the Moscow Committee for Architecture. At the beginning of September, they were judged by an international jury. 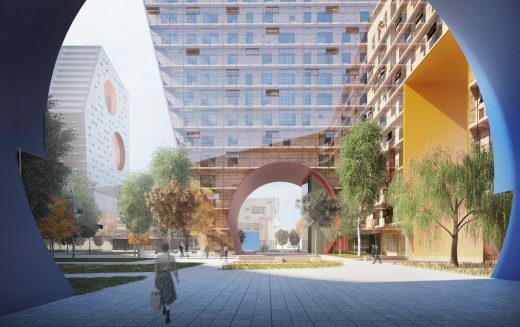 They judged proposals for the Moscow agglomeration as a whole, for the new extension of the city and for a new federal government centre to be located in the new extension. Garage Center for Contemporary Culture unveiled concepts for a new building in Gorky Park, designed by Rem Koolhaas’ OMA. A renovation of the famous 1960s Vremena Goda (Seasons of the Year) restaurant, a prefabricated concrete structure that has been derelict for more than two decades. OMA’s design for the 5,400 square meter building includes exhibition galleries on two levels, creative center for children, shop, café, auditorium and offices. OMA is collaborating on the project with the young Russian practice Form Bureau. December 1, 2017 in Moscow.